If you are reading this post, you probably own a business or are thinking of starting one. It is a fact that many businesses fail in the first two years. One of the reasons is that the business owner is so busy operating the business that they don’t take time to evaluate what is going on. It is the old adage you can’t see the forest for the trees. Let me give you an example of how monitoring your business with a profit loss statement can help you save potentially thousands of dollars by giving you a real life example on one of our clients. This client owned a heating and air conditioning business. He did great work and was always busy because he got many referrals. The problem was that even though he had a lot of work, he never seemed to have any money. It was a family owned business and his wife tried very hard to keep the bookkeeping straight, but she was very busy with their ten children. They asked us to come in and help them get their records straight. When we were done, we printed a profit loss statement, which shows income and expenses. As we reviewed the statement, we discovered he had spent $12,000 on advertising. We asked how much business he had gotten from the advertising. He said, none. Wow, $12,000! This is a great example of how keeping your records current and reviewing a profit loss statement on a regular basis can save thousands of dollars and could even save your business. Last week we talked about paying employees vs contract labor. Contract labor is paid with a 1099, so we thought it would be a nice transition to talk about 1099 forms this week. Have you ever noticed at the beginning of the year you get a lot of forms in the mail that say form 1099—important tax document? Depending on your circumstances, you can get a 1099 A, 1099 B, 1099 C, 1099 INT, 1099 DIV, 1099 R, 1099 G, or 1099 MISC just to name a few. Perhaps you have wondered what they all mean and if the income on all these forms is taxable. To understand why you are getting so many different form 1099s, let’s address the main question. What is a form 1099 and why do you receive them? Well, when a business or government agency pays money to an individual that is not an employee, the IRS requires them to report the payment. So, form 1099 is the way the IRS knows that you received money other than your main job. This way the IRS can not only make sure you pay taxes on all the money you receive but also that the one who pays you correctly reports it on their taxes. Several different things are reported on 1099 forms. Interest, dividends, retirement income, contract labor, tax refunds, unemployment, stock sales, and gambling winnings are the most common. Receiving 1099 forms is actually a good thing. Every time you receive a 1099 form it tells you who is reporting income to the IRS in your name and Social Security Number. This way you can make sure someone hasn’t reported income in error or even fraudulently. For example, our accounting firm had a client that was realtor. She made about $30,000 in a given year. The broker she worked for owned two companies and by mistake both companies reported the same money. She didn’t pay attention to the 1099 forms she received and filed her taxes with the correct amount earned. About a year later, she received a large tax bill because the IRS added in the 2nd 1099—doubling her income. There is no need to be afraid of 1099 forms, but it is important to keep track of them and to make sure they are entered correctly on your tax return. 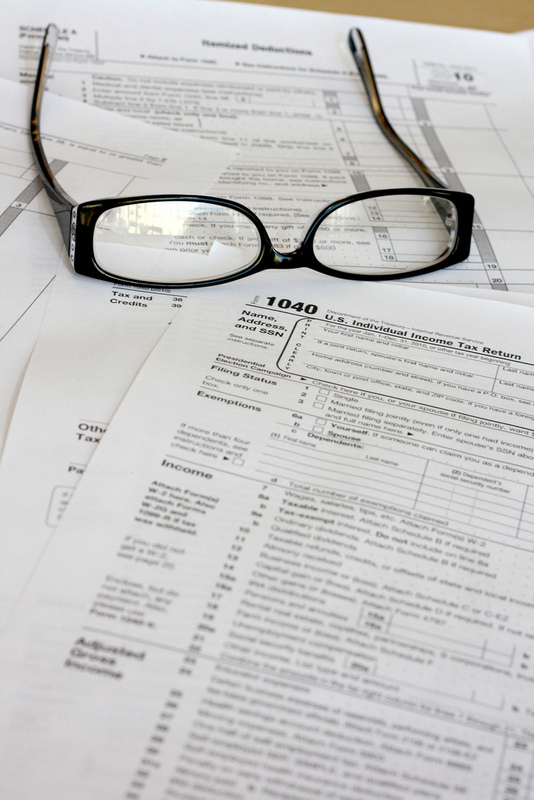 For more information about 1099 forms and how to report income from them, click here. First let’s look at compensating your staff as employees. If you choose to hire someone as an employee, you have to pay half of their Social Security and Medicare tax, pay unemployment insurance on them, file quarterlies, and send them a W-2 at the end of the year. This can be costly and time consuming, but it does create some benefits for your employees. If you are looking for a more cost effective way to compensate your staff, you might consider hiring them as independent contractors. This eliminates having to pay half of the Social Security and Medicare tax, the unemployment insurance, and filing quarterly taxes. The business owner still needs to generate a 1099 form at the end of the year and give that to the independent contractor, but the costs are considerably less. The IRS watches very closely how you choose to compensate people for the work they do for you. The IRS has come up with specific criteria for determining whether a person is an employee or independent contractor. If you don’t follow the specific criteria then a worker can be considered an employee and you could find yourself paying back Social Security and Medicare tax and unemployment insurance. With that can bring large penalties and interest. So how do you decide which is the best way to compensate your workers? That is entirely up to you, but the most important thing to do is to make sure you are following the rules for paying employees and independent contractors correctly. Check out our resources at Avoidbeingaudited.com we have the information you need to make sure you are following these rules. New Name, Same Great Blog! Hi faithful subscribers and followers! We wanted to let you know that we are going to be making some changes to our blog. You have probably seen us mention the website avoidbeingaudited.com. This website is a project we have been working on for about a year. Our goal is to create a resource for business owners and individuals to educate themselves on the practices of the IRS, so they can avoid being audited and save money on their taxes. Education is key to doing so! For the past year this blog has been hosted and run by our mother company Soulence Tax and Accounting. We have a lot of great information that we want to connect with our new project avoidbeingaudited.com. So we will be transitioning this blog from Soulence to Avoid Being Audited. Don’t worry! We will still be providing you with the same great information. We are just giving ourselves a new title and will be broadening our efforts to reach out to business owners and individuals! Thank you for sticking with us and making this blog the success it has been so far. We look forward to continuing to share more helpful tax information. If your company is a C Corporation or an S Corporation, the IRS requires the officers of the corporation to be paid a reasonable wage. There is a lot of debate on what officer wages are, when it is necessary to pay them, how to pay them, what an appropriate amount to pay is, and so on. However, if your company is a Limited Liability Company or Sole Proprietorship you are not required to pay officer wages because most of the time there are no officers in these entities. There is a lot of controversy about officer wages. One of the main reasons for this is the IRS has stated that the wage should be a reasonable wage. So when setting an officer wage, there is not a clear cut way to figure it. Another reason for the controversy is you are required to pay Social Security and Medicare taxes on wages that are paid to officers. This tax is 15.3%. As a result, most business owners want to minimize the compensation to officers, so they can minimize the amount of taxes paid. Officer wages have recently become a big concern for the IRS and should be structured correctly to avoid penalties. For more information about what officer compensation is, how to set up a reasonable wage in your own business, how to save taxes, or to learn more about other tax deductions you may qualify for, click here. How many times have you paid a bill and then thrown it away? How often do you get your bank statement, balance your check book, and then throw away the statement? Why would you want to keep all that clutter? Let me tell you a story that will show you why you shouldn’t throw receipts or bills away. We had a client that owned a drywall business. His previous accountant told him that he didn’t have to keep his receipts or bank statements because he could just take standard deductions for his expenses. By the way there are no standard deductions for business expenses. This went on for about three years. One day he got a notice that the IRS was auditing him. He went to the audit thinking the accountant had everything under control, but obviously the accountant didn’t. And unfortunately, the IRS didn’t care that the accountant gave him bad advice. They fined the accountant, and when the man couldn’t produce any records they gave him a bill for $250,000. Keeping good records is important for tax purposes whether you have a business or not. There are many things that can be deducted that will be disallowed in an audit if you don’t have good records. Also keeping good records is important in case you need to prove you paid a bill. We have a client that bought a carpet cleaner about ten years ago. When he paid it off, he got a statement that showed they had paid the bill in full. Every four years he gets a letter from a collection company stating that he still owes money on the account. Because he saved that statement, he has been able to prove the account was paid in full. As you can see, keeping good records and saving receipts is very important. For more information on what records you should keep and how to keep them, visit avoidbeingaudited.com. We have tons of free resources for you to learn about bookkeeping and how to avoid IRS audits. Article posted by Matthew Anderson of Soulence Tax and Accounting.